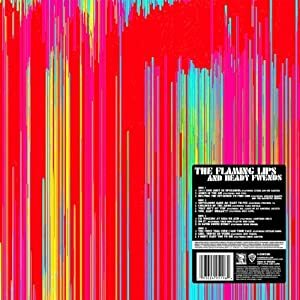 On Record Store Day, the classical group of guys known as The Flaming Lips released a collaborative album with a TON of artists. Unfortunately, I didn't arrive in time to my local record store to get a psychical copy of it (sad face). I unfortunately had to result to mediafire to get it. I really do wish I could've gotten the vinyl copy of it. The album starts with the much buzzed colab between between Ke$ha and also Biz Markie. The song, "2012 (You Must Need An Upgrade) is a wildly noisy adventure about partying at the end of the world. Ke$ha actually sings really well on the song, and Biz Markie yells it out on the last minute of the song. It's really pretty great. The next track is "Ashes In The Air" with Bon Iver, and despite some pretty underwhelming opening lyrics, the song transforms into this beautiful masterpiece. "Helping The Retarded To Find God" (featuring Edward Sharpe And The Magnetic Zeroes) is also pretty beautiful, combining these very zappy electronics with some rather reverby Guitars. "Supermoon Made Me Want To Pee (feat. Prefuse 73)" is a noisy rocker that resembles the best of tracks from Embryonic. It's pretty out there and loud and experimental. "Children Of The Moon (feat. Tame Impala)" is a 70's Garage fuzz + Flaming Lips electronic blips track that just sounds awesome. "That Ain't My Trip (feat. Jim James) isn't really what you'd expect between a collaboration from the Lips and the My Morning Jacket front man. It's a really bombastic track that just pummels anything in its path. "You, Man? Human? (feat. Nick Cave)" is actually disturbing mix of sounds. From the loud bass to the harps to the children's choir to the church bell to Nick Cave's odd lyrics and vocal style, this track is like a bowl of fruit loops that's been left to sit out for to long, but it somehow tastes good still. I love "I'm Working At NASA On Acid (Feat. Lightning Bolt)", but I did before this album came out because it was on the Flaming Lips/Lightning Bolt EP. "Do It! (feat. Yoko Ono Plastic Band)" is a very catchy 60's psychedelia jam on drugs. It's pretty awesome too. "Is David Bowie Dying??? (Feat. Neon Indian)" is another track that came out before the release of the album, and I loved it too... The next track features Eryhkah Badu, and it's a 10 minute track of absolute beauty. The next track has New Fumes on it, and resembles a new age Pink Floyd song. Definitely resembles something off The Wall but with Lips electronics and bombastic sound. "I Don't Want You To Die (feat. Chris Martin from Coldplay)" is a very good way to end the album. It's a very dreamy ballad that just soars and and sounds like it's being played in an abandoned computer filled hall. I really love this album. Nearly every track has something interesting to offer. It resembles Embryonic, but re does it just right with all the right people to make that sound interesting. Super masterful album. Go check it out. Really. You need to. and my first time seeing the local super group The Hips. Both bands made for a very solid night of indie rock. The Hips is a local supergroup that is known for their awesome tunes and innuendo filled lyrics. And they definitely didn't dissapoint. The smooth keyboards and light guitar and bass work made this a very fun ride. The guys in the band are really nice too. I would recommend them to anyone who's in the mood for a nice indie pop/rock show. Go buy their cassette. Now, we've seen Ghosty live before [with Someone Still Loves You Boris Yeltsin], and it was definitely fun to see them a second time. I love their rock/pop tunes that have a slight-ly dark tinge to them. We only got to stay for a few songs, but they were a few really great songs. Andrew Connor has a perfect voice, their use of effects was very strong, and their drummer is a best. Take a listen to their latest LP below.